Chelsea Clinton and Marc Mezvinsky are now officially married at what was one of the most protected wedding sites of all time. Even the air above the wedding location was an official government no-fly zone during the wedding to prevent overhead photographs but we managed to get our hands on these photos thanks to Yahoo News. 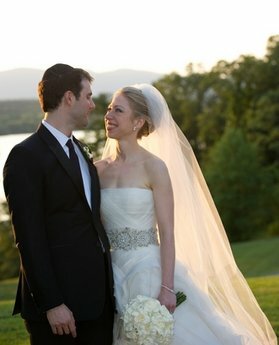 Chelsea Clinton and Marc Mezvinsky during their wedding, Saturday, July 31, 2010 in Rhinebeck, N.Y.
Another Chelsea Clinton and Marc Mezvinsky wedding photo from today. 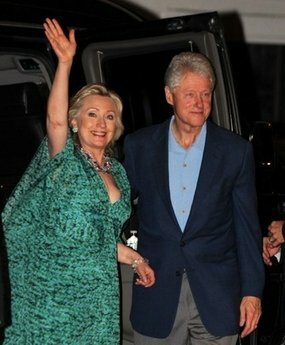 Former president Bill Clinton and Hillary Clinton arrive at their daughter Chelsea’s wedding. Designer Vera Wang who made Chelsea’s wedding dress in attendance at the wedding on July 31, 2010. Clinton friend Ted Danson and wife Mary Steenburgen in attendance. 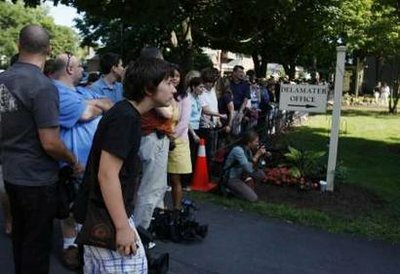 Spectators and journalists look on and try to get a glimpse of the wedding. What a magnificent wedding. It only happens once in a lifetime so let them enjoy the moment and not be criticized about the expenses or ruining somebody’s wedding on the same date. God Bless you March and Chelsea and congratulations to you both and your parents: Pres. Clinton and madame secretary Hilary and to Marc’s parents. May your marriage last till death do you part. May every happiness be yours and may you have a lifetime of love, special moments, and all that you desire. May you and your families feel the joy and fulfillment that this wonderful union brings. Let your wonderful wedding be a sparkling reflecting of your future together. And thanks to the proud parents for putting on such a magnificent and elegant event that no one should ever forget! was monika lewinsky invited to the wedding?